Nestled in the foothills of the Chiltern-Mt Pilot National Park in North East Victoria, this four acre garden is comprised of many rooms each with its own character and style, crammed with an extensive collection of native and exotic plants. Unusual bulbs, ornamental grasses, succulents, perennials, water plants, flowering trees, shrubs and an extensive collection of coloured foliage plants make this a garden for all seasons. Located just a 15 minute drive from Beechworth, the garden and nursery are the ideal spot for plant lovers. 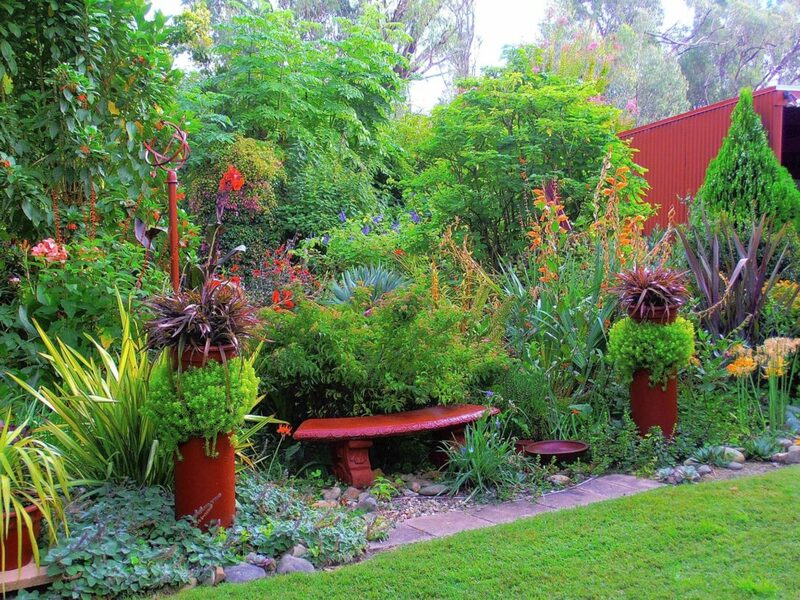 The gardens are designed to entertain and amuse visitors with quirky garden art and bold colour designs as well as provide the more serious gardener with an understanding of plant species and the use of water maximising techniques. Humming with wildlife, many native birds find sanctuary in the leafy borders. Several species of Honeyeaters, King Parrots, Red Browed Finches, White Winged Choughs and Satin Bowerbirds are just a few of the permanent residents. The Nursery stocks an ever-changing collection of unusual drought and frost hardy plants – including perennials, succulents, ornamental grasses, shrubs, water plants, bulbs and ground covers, at reasonable prices in a peaceful garden setting.